Have a teenager that travels alone and you would like to ensure security and comfort while waiting for their flight? 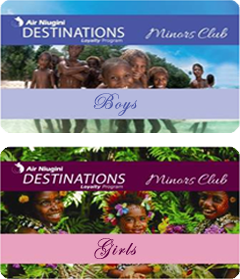 Take advantage of the exclusive privileges and services offered by Air Niugini's Minors Club Membership. Enjoy our increasing network of domestic Executive Club Lounges in PNG with Minors Club Membership. Eligible for ages 12-17 years old.